Leading Scottish portrait painter during the late 18th and early 19th centuries. In about 1771 Raeburn was apprenticed to the goldsmith James Gilliland and is said to have studied with the Edinburgh portrait painter David Martin briefly in 1775. But for the most part Raeburn was self-taught, progressing from miniature painting to full-scale portraiture. A portrait of George Chalmers (1776; Dunfermline Town Hall) is Raeburn s earliest known portrait, and its faulty drawing and incorrect perspective suggest the artist s lack of formal training. By his marriage to a wealthy widow in 1778, he achieved financial security, and during the next four years he considerably improved his artistic skill. In London in 1785, while en route to a tour of Italy, he met Sir Joshua Reynolds, whose works were already familiar to him from Scottish collections and engravings. A man of many interests and a good conversationalist, Raeburn became a popular member of the new cultured Edinburgh society. By about 1790 he had painted the portrait of his wife (Countess Mountbatten Collection) and the double portrait of Sir John and Lady Clerk (Sir Alfred Beit Collection), in which the artist experimented with unusual lighting from behind the sitters heads. 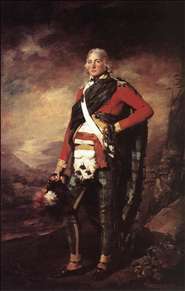 During the following decade Raeburn produced some of his most brilliant portraits, such as Sir John Sinclair (c. 1794-95; National Gallery of Scotland, Edinburgh), which foreshadowed The MacNab (c. 1803-13; John Dewar and Sons, Ltd., London), in which tonalities became darker and lighting more contrasted. In 1812 he was elected president of the Edinburgh Society of Artists, becoming a Royal Academician in 1815. He was knighted in 1822 and shortly thereafter was appointed His Majesty s Limner for Scotland. 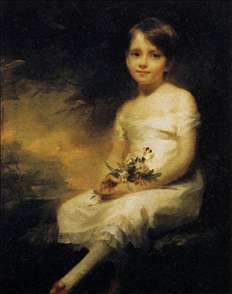 See more details about "Portrait of Sir John Sinclair"
See more details about "Young Girl Holding Flowers"